Rosemary Ellis (née Collinson) was born into a creative family in 1910 in North London, her father a trained cabinet maker and grandfather a leading designer for a furniture company. At the outbreak of World War 1 Rosemary and her family moved from London to the New Forest to live with her mother’s parents. She was said to have developed a great love for the forest and animals whilst there. Moving back to London Rosemary went to study art at Regent Street Polytechnic in 1928. Here she met artist and tutor Clifford Ellis whom she was to marry in 1931. 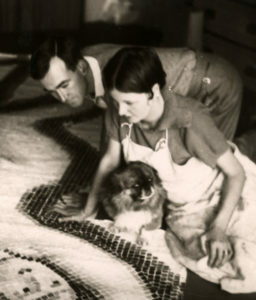 At a time when women did not usually continue to work after marriage, Rosemary and Clifford became artistic partners collaborating on freelance work. Together they went on to create posters for Shell, Lyons, London Passenger Transport Board and the General Post Office. The couple signed their work jointly with the lead artist’s name written first. 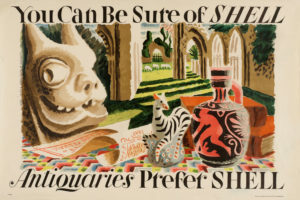 Note: Jack Beddington was the Shell-Mex & BP Ltd Publicity Manager between1932-1939 who started commissioning fine artists rather commercial artists for the Shell poster (lorry bill) series. He is credited with creating innovative campaigns for Shell and becoming a patron of the arts. He commissioned female artists at a time when women were not given much press or publicity, even for solo exhibitions. Rosemary and Clifford became perhaps most well known for designing over 60 book jackets for the New Naturalists books plus Collins Countryside series and King Penguin books. Mosaics, ceramics and decorative tiles were all produced by this creative partnership. In 1936 Rosemary’s husband Clifford joined the Bath Academy of Art becoming Head of the Art School two years later. After World War 2 the Academy was invited, by Lord Methuen – the artist Paul Ayshford, to move to Corsham Court in Wiltshire. The school is now part of Bath Spa University. Together the couple remained there for over 25 years, with Rosemary a leading member of staff. The school engaged young artists such as Kenneth Armitage, Terry Frost, William Scott, Henry Cliffe, Peter Lanyon and Howard Hodgkin to teach. Many of these would become key figures in the history of 20th century British art and the Modern British period. Led by Clifford and Rosemary Corsham Court became a place where artists discussed art, socialised and worked together. The results of this can be seen in both Clifford and Rosemary’s art, with influences of others artists styles flowing in to their work. During WW2 Rosemary was chosen to work on the ‘Recording Britain’ project, an extension of the Official War Artist scheme. The project employed artists on the home front to create a record of British lives and the landscape during a time of great change. This important collection now houses over 1500 watercolours and drawings from this period. We have four posters and three paintings in the Shell Heritage Art Collection by Clifford and Rosemary Ellis, created between 1933 and 1937. 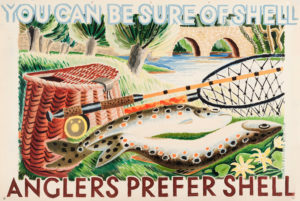 Posters: Lower Slaughter, 1933; Anglers Prefer Shell, 1934; Antiquaries Prefer Shell, 1934; Chanter’s Folly – Appledore, 1937. Paintings: Lower Slaughter, Anglers Prefer Shell, Antiquaries Prefer Shell. Some of these posters will be on show in the exhibition ‘Making Art Matter; Clifford & Rosemary Ellis’ at the Victoria Art Gallery in Bath, 8th Sept – 25th Nov 2018. Shell Heritage Art Collection Manager, Nicky Balfour Penney, will be giving a talk at the gallery about the Ellis’ work for Shell on Wednesday 26th September 2018.